SALZBURG/VIENNA – OCTOBER 15, 2018 – Constantia Flexibles, headquartered in Vienna, is one of the world’s leading producers of flexible packaging for the food and pharmaceutical industries. The company’s customers include international food, pet food, personal care, and pharmaceutical corporations local market leaders. Be it a chocolate bar, a pet food container or a yogurt: the packaging of these products could soon be enriched with digital information experienced by consumers via smartphone. This feature also allows brands to learn a lot about customer shopping habits. With that in mind, the company has developed the innovative platform “Constantia Interactive”. Strategic technology partner is Wikitude, the world’s leading independent AR technology provider. Thanks to the AR software from Salzburg, smartphones can easily recognize a variety of shapes and packaging. The aim of the partnership is to jointly expand the “Interactive Packaging” market. “Google search revolutionized the Web 20 years ago. Likewise, augmented reality will fundamentally change the way we consume information.” The strategic collaboration with Constantia Flexibles is another important step in that direction. 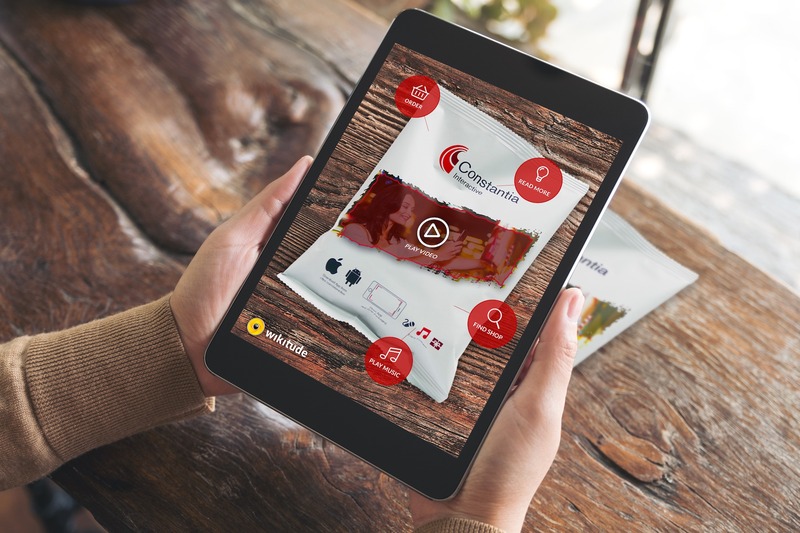 “When customers unite product discovery with such apps on their everyday shopping, augmented reality will soon be the norm to every consumer”, says Herdina. For Constantia Flexibles, ‘Interactive Packaging’ will be one of the key topics at this year’s Pack Expo, the largest packaging trade show in the world which takes place in Chicago from October 14 to 17. For brand owners the benefits of interactive product packaging and the associated customer relationship platform are obvious: they learn a great deal about the wishes and habits of their consumers. With this valuable data, companies can improve their products and target consumers more effectively without having to pass on data to third parties. All of this strengthens the customer’s relationship with the brand. More information about Wikitude and Interactive Packaging from Constantia Flexibles Holding GmbH. All images free of charge for press use. In full size for download available here. Constantia Flexibles is the world’s fourth-largest producer of flexible packaging. Based on the guiding principle of People, Passion, Packaging, some 8,300 employees manufacture tailor-made packaging solutions at 40 sites in 18 countries. Many international companies and local market leaders from the food and pharma industries choose the sustainable and innovative products of Constantia Flexibles.